I must confess this is not my idea, I saw it in a magazine, but it is a great idea to help organize your pantry with a simple shoe rack. 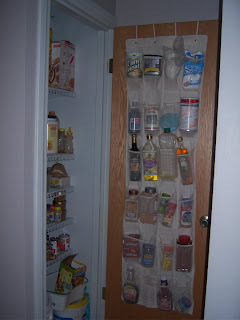 This is especially nice with all those jars and containers that get lost amidst the cans and boxes! This is genius! Thanks for sharing. OH my I LOVE, LOVE, LOVE that idea. My pantry is so small I need all the help I can get. Doing it tomorrow! I also got this idea from a magazine, but we bought one for our coat closet and keep hats, gloves, and scarves in there. Bryan's are down low so he can reach them himself. It's great!